Print&Pattern has to be my favorite blog of all. The owner and creator Bowie Style from UK offers daily the most incredible images from work of various artists. I have been following her blog for a while now and just recently got serious about contacting her about featuring my work. She emailed me back quickly saying that she is planning on featuring Le Papier Studio this week….and she did. 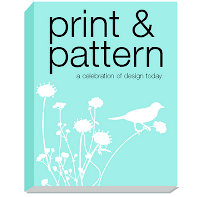 If you head over to Print&Pattern now, you will see my work there. It is such an honor to be included in such inspiring blog. The other good news is that Bowie is coming out with a Print&Pattern book and she is going to be calling for submissions soon. I will be waiting for that for sure! Take a look! and be amazed by all the great stuff out there…. The post Print&Pattern appeared first on Le Papier Blog.